Lee Mason scores against Scarborough. 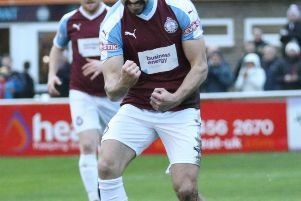 New dad Lee Mason delivered a Boxing Day present to remember for South Shields as he inspired a vital 3-1 win at Scarborough Athletic in the Evo-Stik Premier Division. The Mariners were a goal behind before Mason - who welcomed new daughter Matilda on Friday – struck twice to turn the game on its head. Ben Harmison netted a stunning goal from distance to seal Shields’ three points late on as they stayed fifth in the table. Lee Picton and Graham Fenton’s side went into the match knowing the importance of picking up maximum points, having drawn 1-1 at Lancaster City on Saturday. They started brightly and could have opened the scoring after just 25 seconds when some fine work by Mason set up a chance for Carl Finnigan, but he fired inches past the post and into the side netting. David Foley also had two opportunities to get on the scoresheet early on, shooting not far wide with his first attempt before his next one was blocked. 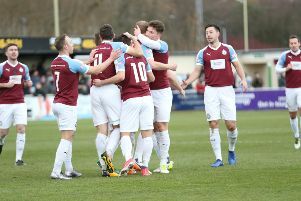 Shields were hit with a sucker punch in the 15th minute, though, when a 25 yard free-kick by Scarborough striker James Walshaw beat Liam Connell to give the hosts the lead. Boro went on to have their best spell of the game and could have doubled their advantage when a knock-down by Walshaw found James Cadman, who volleyed over from close range. The home side again went close soon after, but Connell did well to cling onto the ball after a flick by Walshaw from a free-kick. Shields had several opportunities to level the scores as the first half went on, with Mason the first to threaten when he headed a Phil Turnbull free-kick goalwards before his effort was hacked clear. A huge penalty appeal for handball was waved away soon after before the Seadogs countered and Connell had to be alert to save from Cadman. The Mariners looked certain to equalise when Mason was sent clean through on the inside right of the area, but his drive was too central and Scarborough goalkeeper Tommy Taylor beat it away. Walshaw almost doubled the home side’s lead a minute before half-time after being sent through on goal, but Connell did well to kick away his shot as Shields survived. It was to prove a crucial save as Mason capitalised on a miscued defensive clearance on the stroke of the break. He raced through on goal on the inside-right of the area and this time drilled a low effort across the goalkeeper and into the corner to deservedly bring Shields level. The second half saw a more controlled performance from the Mariners as they showed greater patience on the ball and worked for their breakthroughs. Finnigan had a low effort from distance saved and Robert Briggs chipped one narrowly over as they began to increase the pressure. They continued to be kept at bay, although they went close again when Nathan Lowe played in Blair Adams on the inside-left of the area and he rattled the woodwork with a rasping drive. Josh Gillies and Craig Baxter also saw shots saved as Shields probed for a breakthrough, and it finally came with 11 minutes left. Scarborough failed to clear a Gillies corner from the right and the loose ball dropped to Mason, who controlled it with his chest before firing low into the net for his second of the afternoon. The points were secured a minute from the end when Harmison advanced into the Scarborough half before beating Taylor with a stunning effort into the top corner from 35 yards. It capped a fine come-from-behind win for the Mariners, who now go into a double-header of home games on Saturday and New Year’s Day as they look to strengthen their promotion hopes. SOUTH SHIELDS: Connell, Baxter, Adams, Shaw (c), Morse, Turnbull, Foley, Briggs, Mason (Harmison 82), Finnigan (Gillies 70), Lowe (Brown 87). Subs not used: Lough, Mouanda. Goals: Mason (45, 79), Harmison (89).